AC Milan striker Mario Balotelli lost his temper during a television interview following his side's 2-0 defeat away to Roma. The 23-year-old former Manchester City forward was substituted after a poor display at the Olympic Stadium. 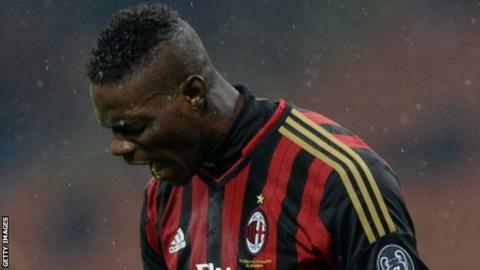 Balotelli, speaking to Sky Italia, criticised pundits Zvonimir Boban and Giancarlo Marocchi. "You don't understand anything about football," Balotelli snapped at ex-Juventus title winner Marocchi. Balotelli has scored 14 times in Serie A this season. But AC Milan, who sacked manager Massimiliano Allegri and replaced him with Clarence Seedorf in January, have endured an inconsistent season and will finish outside the top three of Serie A for the first time in six years. Italy international Balotelli, who is hoping to play in this summer's World Cup, was replaced by Giampaolo Pazzini in the 69th minute in Friday's defeat to second-placed Roma. Balotelli was criticised by former AC Milan midfielder Boban after the match, with the ex-Croatia international calling his performance shameful. "You always talk about me. When Milan win Mario's great, but when Milan lose it's all Mario's fault," said Balotelli in a live television interview after the game. "I don't need your criticism, I criticise myself." Boban had said Balotelli was not a top player during the match. "I never said I'm a top player," added Balotelli. "I am a perfectly normal player, it's you that say I am an exceptional player, you always expect me to score five goals a game. "You always talk and talk, but there's no point to saying any of these things. No point at all." Balotelli threw his microphone down at the end of the interview.